This is the demo that forever changed the faces of both online gaming and the role-playing genre. Hack your way through one full level of the game in the Warrior character class. Diablo is a fantasy role-playing game that captures the spirit of original face-to-face games like Dungeons and Dragons. With a straightforward story line based on fulfilling quests assigned by nonplayer characters, you equip yourself, venture into a dungeon, and slaughter legions of hideous foes. Along the way, you unearth magical treasure, discover mighty spells, and earn experience that can be used to increase your combat abilities. Almost all of your time with Diablo is spent underground, exploring and conquering ever-deeper levels of the gloomy dungeon. Combat is fast, brutal, and constant. Whether your weapon of choice is a sword, axe, bow, or spell, all forms of combat employ a simple two-click system, which is elegant without being simplistic. Replayability and customizability are Diablo's strong points; the incredible number of options and possibilities - and the fun that can be had experimenting with different strategies - keeps players coming back for more. All the dungeon levels are generated anew each time you draw up a new character, and are packed with an entirely different set of textures, features, items, traps, creatures, and quests. While one game may stock the fifth subterranean level with an army of skeleton warriors, the next game may pack that level with hordes of winged gargoyles. Multiplayer options exist for two to four players, so you don't have to take on the world by yourself unless you prefer solo play. Released in 1997, this game is far simpler than newer titles that have expanded on its original concepts; there are only three character classes and a limited number of ways to truly distinguish your character from others. But sometimes there is no beating a classic. 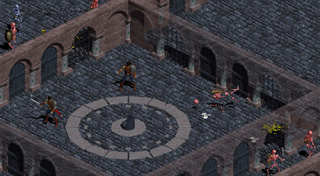 Three years old and with a sequel due in mid-2000, the original Diablo has aged remarkably well. Many of its features will seem familiar to seasoned fantasy gamers, just because so many of them have been incorporated into later RPGs. Players who yearn for uncluttered adventuring and those with older computers will definitely want to check this one out.